Experience with being a gym leader: I was the Grass Gym Leader on a previous server, beyond this however I have some experience with monotype competitive battling, though again this is quite limited. How long have you been playing Pokémon/Pixelmon? : I started getting particularly interested in competitive battling in Gen 5, though at the time I didn't really understand much about team composition or the need for different Pokemon filling different niches. I really began to apply myself in competitive battling during Gen 6 and 7, though my default competitive format is VGC/Doubles. With that said, I have battled in Singles formats and understand the nuanced differences between the two ways of battling. Do you play Pokémon/Pixelmon competitively? : As above, I still try and play competitively. I would say that I hover around the 'post-Smogon' position, in that I will do primary research on Pokemon through websites like Smogon, though when it comes to creating movesets, etc., I'm growing in confidence in making my own. On a scale of 1-10, how would you rate yourself at competitive battling? : 7-ish. Problematically, I use the Pokemon that I like rather than the Pokemon that are 'objectively good'. Because of that, I do lose a number of battles, though often it is about finding how to apply certain Pokemon to the Meta. With that said, I know I'm not the best battler out there. I'm fairly good at predictions, but I'm not good at predicting whether the opponent is a conventional battler or not. How long can you play per day? : I work full-time 8:00-16:00, however I am further ahead than the server's general user base timezone wise, so my evening is your daytime/early evening. I would be around most evening for a few hours, depending on how busy the server gets. Why should we pick you? : I like battling on the server, but beyond the tourneys and occasionally battling with friends over and over again, there's nothing new to do. Being a gym leader would be beneficial (for me) to find new ways to battle and to re-engage with the server, but also because I like to think that people on the server like me and see me as approachable and friendly enough to ask to battle. I feel like I can bring value to the server's wider community, particularly in giving new players reasons to stay - with the number of players that AFK or ghost/shadow the chat, I think new players can feel a bit alienated. I think having active and interactive Gym Leaders will encourage new players to feel the server is an environment they would like to stay in. Really quick remark before I analyze the team further, why the trick room Staka only to use neutral or positive speed natures and even a tailwind? 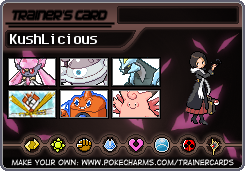 Secondly I wouldnt use GDrain+leech+synt all at once in a Venussaur. Yeah, when I first started the team I wanted to go down the TR route, but as I progressed further it became clear that I couldn't get it to run the way I wanted it to. I really should just remove him and put in someone else that would utilise the Speed Boosting, maybe even some Sun integration. As for the over-healing on Venusaur, I'll have a look into that. I've found it successful up until now, but I suppose I haven't tried reducing down the healing moves to see if it can still run in another way. One option I think might work well is swapping out Stakataka with a straight-out attacker, either Aggron or Rhydon. Hey there for future reference update the original post with the new team. Also based on those 2 mons id like to offer you an alternative set for both. https://pokepast.es/1036be29d34c8075 the rhyperior set can tank a solarbeam from a very large threat to your team, Charizard Y while 1hitting it in the process and doubling down as a few utility moves and being able to break through sashed mons, the Bulu besides providing the EQ damage reduction+healing utility from his terrain also packs quite a punch while dealing with another threat (Hawlucha) fairly well (until electric seed is a thing at least) 1 hitting it with zen headbutt or denting it quite well with stone edge while also posing a threat with a healthy variety of coverage moves. Thanks for the ideas, Kush - they're much appreciated. I'll jump on Showdown and see how I get on with the Bulu and Rhyperior updates. I know it's a bit late in the tooth, but I've updated the team after more matches on Showdown. There is no reason to be running Aurorus in this gym, its 4x weak to steel and fighting which are already common threats, the hail does nothing but damage your own team, and its not gonna live long enough to be useful. I would recommend a different rock type like Nihilego to replace it if you're looking for speed and power. Good luck. We put the Aurorus in there after a couple of tests with Kush because weather teams were problematic for my team (or at least in the trials we did), but I take that on board. I'll have a play around with Nihilego and see how that goes, can't say I've ever used one.